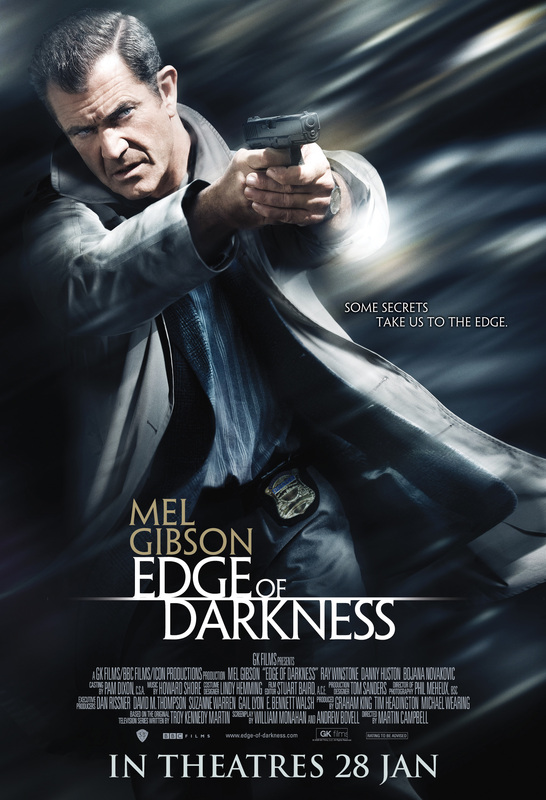 Edge of Darkness is a Mel Gibson cop revenge movie. This reasonably interesting flick garners a seven. Mel Gibson plays a tough, loner detective (a real stretch from his prior acting roles…) in Boston. As you know from the trailer, his daughter is murdered in front of him. The killer shouts out their last name as he fires the shot leading the police to suspect that the father was the target as a result of his police work. Gibson goes into angry father bent-on-revenge and the truth mode. Unlike the Lethal Weapon movies, this doesn’t become a kill, kill, kill fest. Of course, there are generous dollops of violence and the bodies tend to pile up towards the end. The film does take a little (I did say little) time to develop Gibson’s character but generally fails to provide much more than a cardboard cut-out of the other characters. They are merely foils for Gibson to push against in his quest for the truth and the murderer. The others’ acting is fine, just shallow. The plot has some twists but plays along a pretty much predictable course. I will have to leave it at that or give away the end (for those who have a 6th grade level of logic). It is a typical story and doesn’t develop new story lines or ideas. But it does provide an entertaining cop/murder/revenge/justice story. I’ve always loved Mel Gibson in roles like these.